Should I Buy a Home Now? Or Wait Until Next Year? 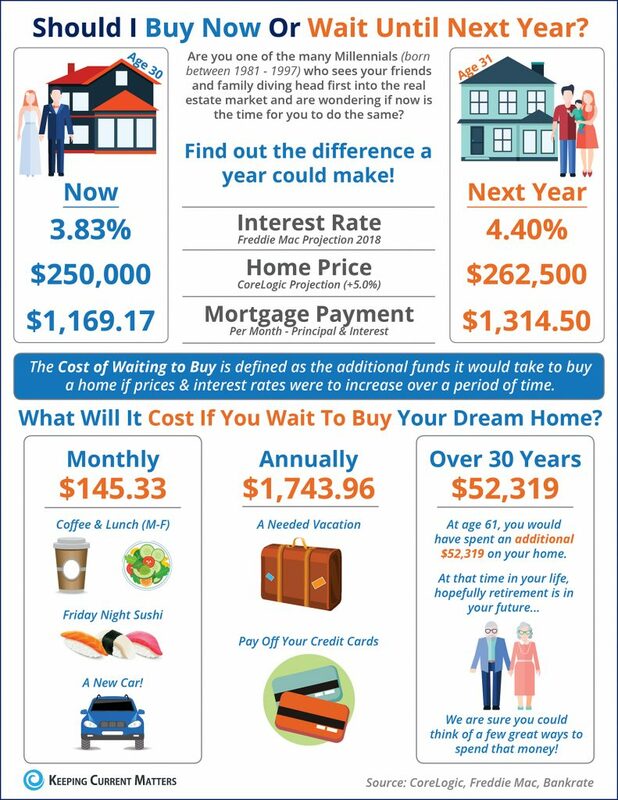 • The Cost of Waiting to Buy is defined as the additional funds it would take to buy a home if prices & interest rates were to increase over a period of time. • Freddie Mac predicts interest rates to rise to 4.4% by next year. • CoreLogic predicts home prices to appreciate by 5.0% over the next 12 months. • If you are ready and willing to buy your dream home, find out if you are able to! © 2019 Garden State Multiple Listing Service, LLC. All rights reserved. IDX information is provided exclusively for consumers' personal, non-commercial use and may not be used for any purpose other than to identify prospective properties consumers may be interested in purchasing. Information is deemed reliable but is not guaranteed accurate by the MLS or Prominent Properties Sotheby's International Realty. Notice: The dissemination of listings on this website does not constitute the consent required by N.J.A.C. 11:5.6.1 (n) for the advertisement of listings exclusively for sale by another broker. Any such consent must be obtained in writing from the listing broker.The data relating to real estate for sale or lease on this web site comes in part from GSMLS. Real estate listings held by brokerage firms other than Prominent Properties Sotheby's International Realty are marked with the GSMLS logo or an abbreviated logo and detailed information about them includes the name of the listing broker. Data last updated 2019-04-22T14:47:17.06.